When I got this tulle skirt years ago, I felt like a lucky ballerina and could not wait to wear the skirt. Today, I still love my tulle skirt and I have styled it in the past with bow pumps for a Christmas event. For today’s post, I paired a peplum top and a button down shirt to create a holiday party outfit. It is the holiday season hence a great time to dress up and have fun digging through the wardrobe. 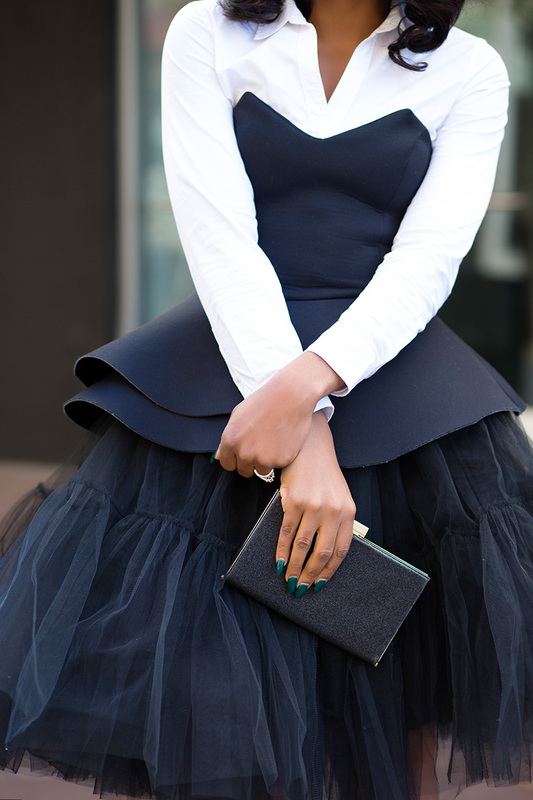 Get out the tulle skirts for fun looks… what are your thoughts? P.S. More sale updates...Express is having a sale of 50% off all items including sales items + free shipping (ends No. 27th at 12PM). Old navy, Banana Republic and Gap with 40% off. Also, check out JCrew for 30% off on select items. I will keep you posted on more sales throughout the week. LOVE LOVE EVRYTHING!! the peplum top is a win! Your legs are beautiful! And you coupled the pieces nicely. I really really like the ensemble Stella! Very creative and well put together!